In the nursery world, there’s a fine line between having too much space and not enough. Ben Verhoeven, president and general manager of Peoria Gardens, has found the secret to walking that line. In all seriousness, though, utilizing a nursery’s space in the most efficient way is a serious concern in the business. Do it right and the benefits can be big; get it wrong and trouble ensues. Because space is at a premium at most nurseries, getting control of that space is an excellent efficiency tool. One of the best tools for doing that is implementing a 5s program, which is a key component of Lean or Kaizen methodologies. The 5s program involves creating a simple, clean and safe arrangement of the workspace, where there is a specific location for everything. Unneeded items are removed, as they only get in the way. The result is less time spent looking for things and more time spent getting things done. Alpha Nursery is a big believer in 5s and has seen great results from it. They did a series of 5s reorganizations on several areas of their nursery — the chemical room, planting sheds, office, label room, loading dock and propagation area. Each time they did it, it was a team effort. It was successful in large part because of the rich and productive dialogue that resulted from that approach. The 5s program, initially developed in Japan, consists of five steps each beginning with the letter “S” — seiri, seiton, seiso, seiketsu and shitsuke. In English, five words beginning with “S” are also used — sort, set in order, shine (or sweep), standardize and sustain — with a sixth “S” for safety sometimes added. There are several online resources that break down each of the steps. The final step — sustain — is key, as it is necessary to make sure that improvements remain in place for the long term. As with other Lean concepts, 5s is an ongoing process that gets revisited so that further improvements can be made. 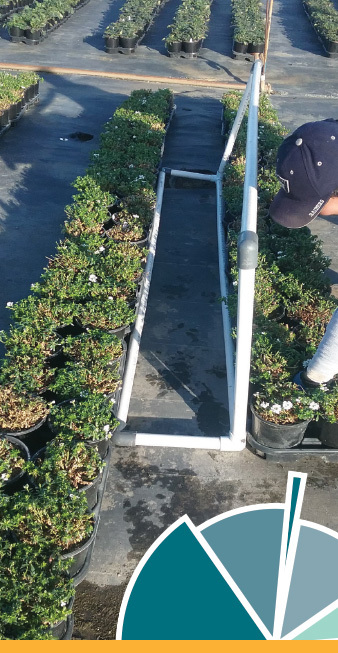 Bailey Nurseries has been shifting to use greenhouse liners — essentially cuttings that have been put in a pot with soil — more and more in its container program to help ensure that plants are finishing faster. Doing so ensures that plants move out of the nursery sooner, thus freeing up coveted and limited space in the container area. Bailey, in fact, has developed its own liners called JumpStarts, which come in hexagonal plugs and are designed for faster finishing times. Bailey grows JumpStarts for sale, but it also uses them in its own operations. Brockshus said they don’t shorten the overall growing cycle of a plant, but they do shorten the amount of time they spend in the greenhouse. “That’s one of the biggest things that we’ve been focusing on to be as efficient as possible,” he said. Bailey has found additional efficiencies with its space by making relatively minor changes to some of its processes. 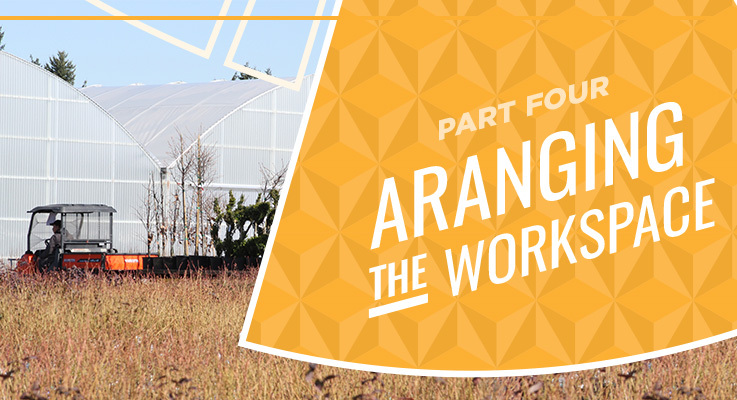 Here in Oregon, Bailey has 10 acres of propagation greenhouses, all of which are individual quonset-story houses. The nursery used to move the crew and plants around to the end of each house, sticking into trays as they went in on conveyors and filled the greenhouses. Now, however, Bailey operates a more centralized workspace in a line coming off the flat filler, with workers sticking cuttings into trays and then onto trailers, where the plants are taken to their respective houses. Essentially, Brockshus said, the people do not move; instead, the cuttings and equipment all go through the one designated workspace. A staff member at Skagit invented a three-sided piece out of PVC pipe that dramatically reduced the time needed to move flats. Before, staff had used empty flats to space plants when they are set down, which required time as well as the strain of bending down. The PVC piece comes in different sizes that work for all the different flat configurations. The idea came from a staff member who worked at a different location, with different duties. It’s one more case of a fresh set of eyes spotting something others were too close to see. The employee has since been made a Lean leader at Skagit, and proud to see his ideas in action. At Peoria Gardens, space is always at a premium, so the nursery made some changes to the plugs it grows to try and maximize the use of space, Verhoeven said. Peoria grows most of its own plugs, and this year, the nursery stopped using its two smallest plug sizes, opting to grow the majority of its annuals in 288-cell plug trays. In the short term, this creates more plug sheets, which are on the bench longer. For example, a 288-cell plug tray takes longer to grow than a 512-cell tray and fits fewer plugs per sheet. But after transplanting, the trays of 288 are finished about a week earlier, according to Verhoeven, and that’s where the gain in efficiencies comes in. Since this is the first season that Peoria has tried this model, it’s too soon to know the outcome, but Verhoeven is optimistic. 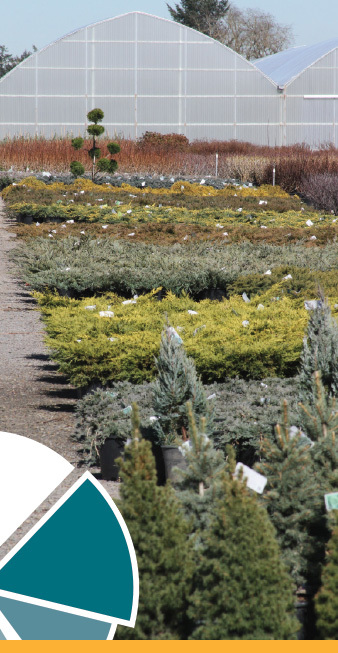 It used to be that Bailey Nurseries would hand-load all of its container shrubs onto trucks for shipping, but the company has been making some changes to improve that system. This spring, it’s embarked on a revamp of its container shipping process that finds workers racking all container shrubs and some bareroot trees. Before, employees would be ready to load a truck by hand in the morning. Unfortunately, the shipping world can be unpredictable and trucks would often show up late. Managers at Bailey would have to scramble to find people to either stay late or work overtime to get the job done. Racking in advance of a truck’s arrival doesn’t do anything to add consistency to the shipping process on that end, but Brockshus said it gives Bailey more control on their side of the equation. “Our time loading may not be any less as a whole, but we now have much more control our end,” he said. Woodburn Nursery & Azaleas has devised a different approach to moving containers. It came about after general manager Tom Fessler and production manager Ron Schmidt visited Europe in 2009. There they saw a buffer belt, which arranged potted plants into multiple rows. The rows could then be grasped and lifted by specialized nursery forks. This process inspired them to arrange their own trailers by forklift, instead of by hand. It used to take four people to do the job, but now takes two. The forks come in different sizes for different sized pots and bed configurations. They are made in-house, and they are color coded by size so that the correct fork can be easily identified. A central precept of Lean is that transportation of product within the farm is wasted effort and should be minimized, though it never can be eliminated. The obvious solution is to minimize trips within the farm, or shorten their length. Alpha Nursery, however, has come up with a not-so-obvious solution — making each trip count. The change came about in response to a change in the way customers place orders. They used to order a semi load at a time. “Now a lot of people have gotten away from that and order what they need, just in time,” Zielinski said. This has reduced not just the size of the order, but the quantity of plants per selection. Alpha stocks 900 different plants in various sizes, and workers found themselves traveling to a far-flung corner of the 150-acre nursery to grab just one of something for an order. “We can’t grow 150 acres of material on 10 acres,” Zielinski said. In response, Alpha recently started staging frequently-sold goods in strategic locations near the loading dock. These staging areas are internally referred to as “stores.” This system allows workers to move these goods in bunches, rather than one at a time. Items in the “stores” are pre-labeled and ready to ship. Rising costs, labor scarcity and competition create challenges for growers. Greater efficiency can be the answer.